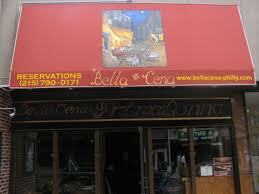 Bella Cena on a Friday evening. My wife and I along with our friends Gerry and Joann didn’t actually need a reason to be at this restaurant at 15th and Spruce, but we did have one. Their son, Keith, is getting married this coming December and he and his bride to be, Becca, had some sentimental attachment to Bella Cena as it was the scene of some memorable dating moments. Gerry and Joann were considering this BYOB as a possible site for their Rehearsal Dinner. I don’t normally read reviews on a restaurant before dining there but for some reason I spent some time reading past reviews on Bella Cena. 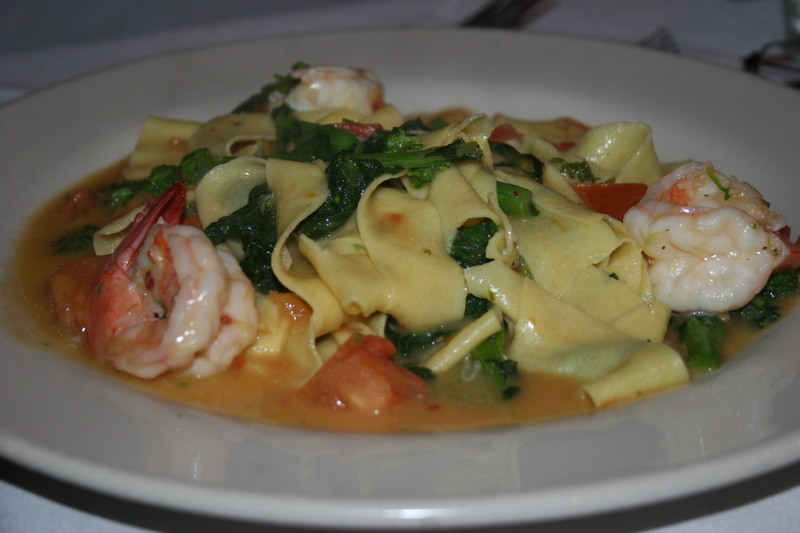 Most commented that they had no problem with the food but that the service was very uneven. The general consensus seemed to be that this eatery was always appeared to be short two or three servers and that resulted in a sense of chaos. Well, the reviews were correct. We spotted our friends and sat with them on entering. Drink service was slooooow and one drink never arrived at all. One of the harried servers suddenly remembered the drink had not arrived but, by that time we had our wines open and it wasn’t that important. It is a nice feature that although Bella Cena has bar service you can bring your own wine with no corkage charge. While in France in October of last year Gerry and Joann had a case of wine purchased there shipped home. Their bottle tonight was from that shipment. It was a 2005 Chateau La Castelot, St. Emilion Grand Cru. This one showed leather and earth with hints of dark berry fruit. Certainly a drinkable wine but not outstanding. My wine was a 2006 Oso Vineyards,”Emblem”, Napa Valley Cabernet Sauvignon. I confess I knew nothing about this wine at the time. 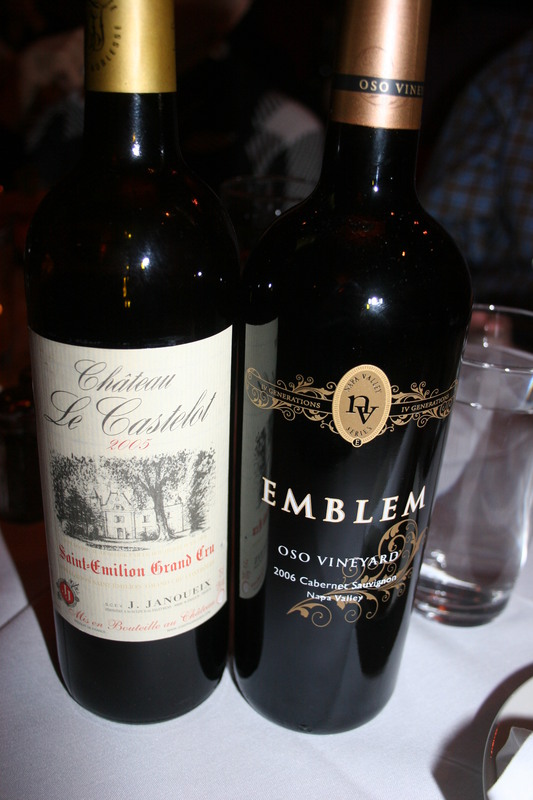 I have since learned that Emblem is the creation of the father and son team of Michael and Rob Mondavi. It was well-balanced with some nice blueberry and caramel notes with flashes of earth and vanilla. The wine retails for $50.00. 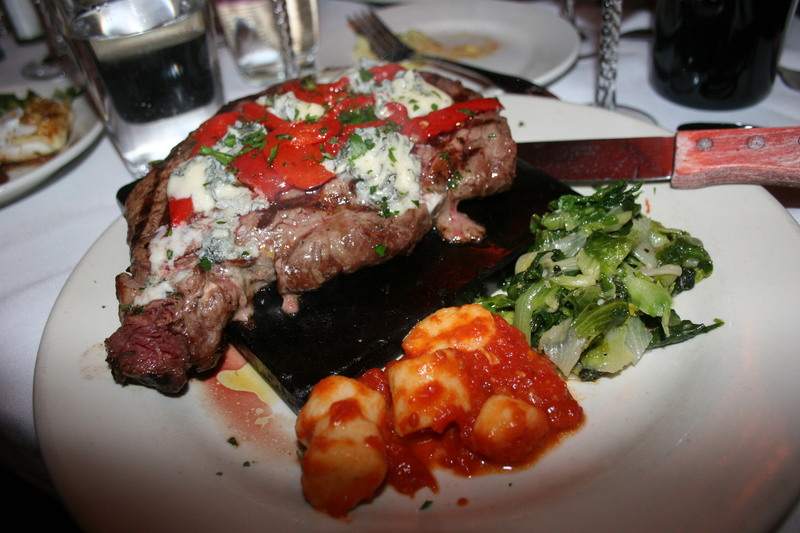 My entree selection was the New York Strip Steak served sizzling on a terracotta stone topped with provolone cheese and served with a side of gnocchi in a marinara sauce ( a little out-of-place with my steak, I thought) and some kind of green veggie. The meal was OK. I did like that the hot stone kept the meat warm throughout the meal and when Gerry set a nice portion of his risotto on a small plate for me it eventually got cold and I was able to heat it up by placing it on the magic stone. The portion was large enough that I was able to bring enough home for another meal. 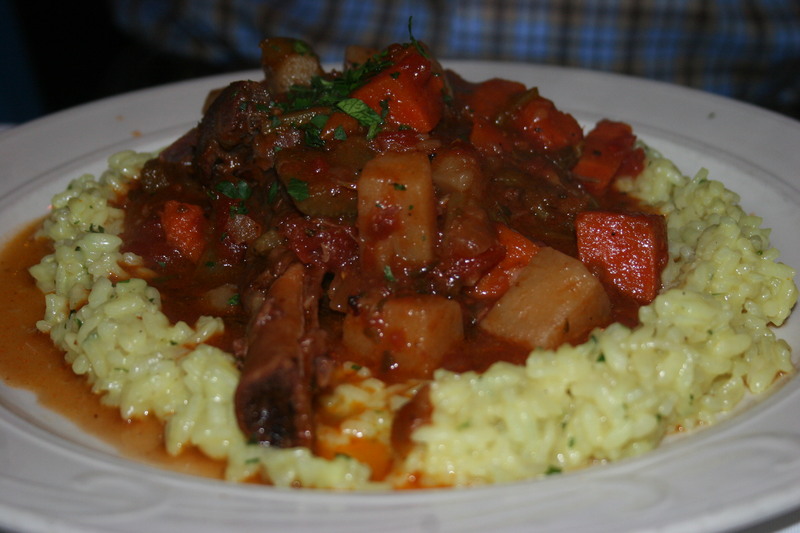 Gerry had the Lamb Shank served over a bed of saffron risotto. 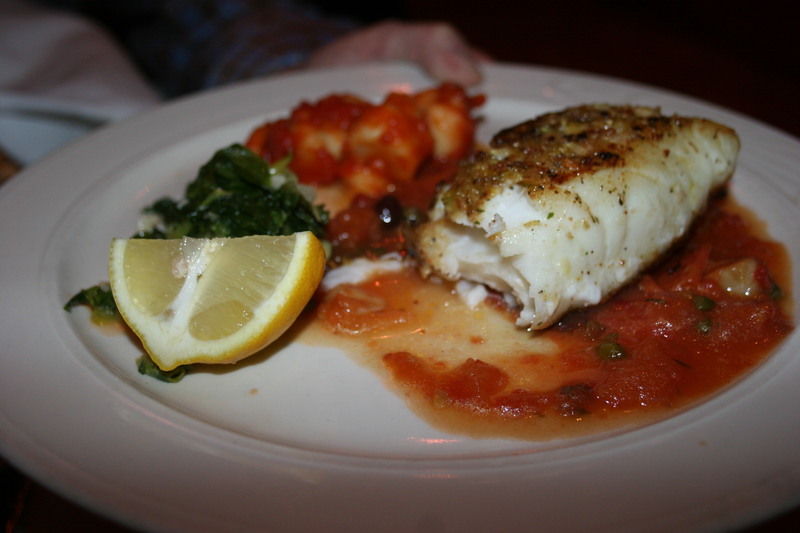 The wives had a shrimp dish and, I believe, the tilapia. 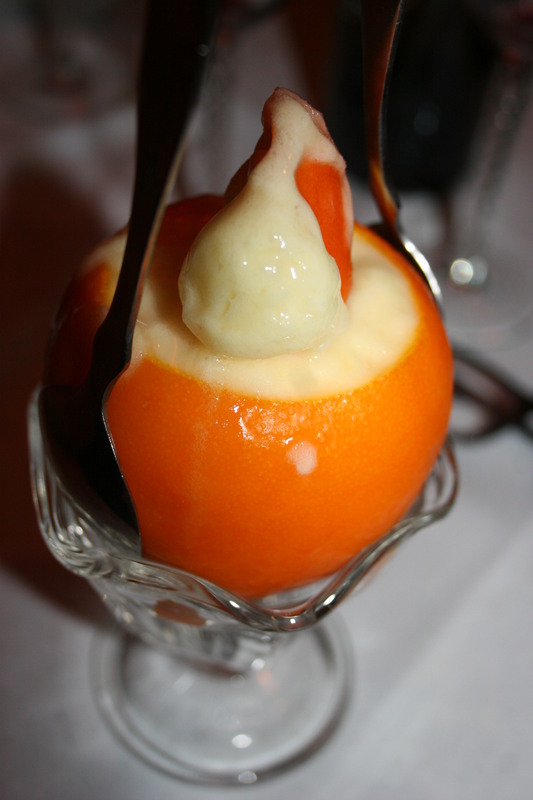 We finished off our meal with some desserts mine was an orange sorbet. Overall, the food was OK and the service erratic. The strange thing was it seemed to us that the service would be easily fixed with just a few adjustments but the reviews pointing out these flaws go back several years so it may just be that it really is hard to teach an old dog new tricks. The final decision was that Gerry and Joann will not be holding the Rehearsal Dinner at Bella Cena.